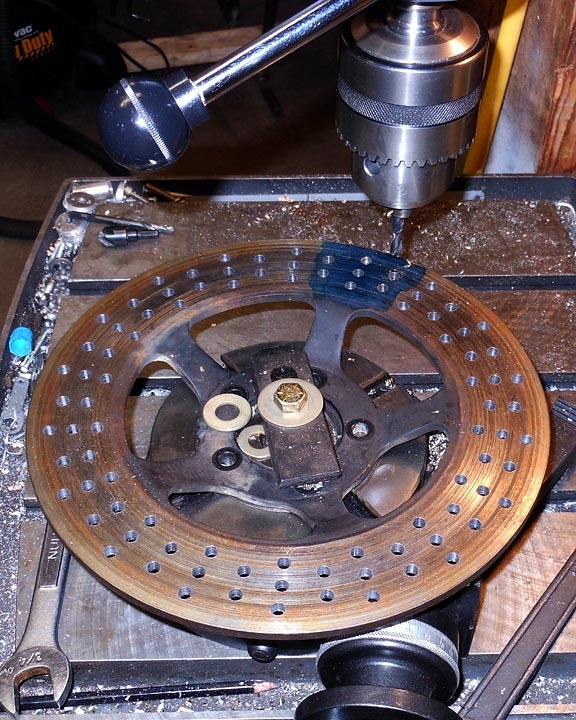 Just a quick progress report on the CX 500 Cafe Racer Build project, I’ve cross drilled the rotor using a rotary table. This was surprisingly quick once I dialed in the rotor to the rotary table eliminating any run out. It went so well that I suspect I will be cross drilling lots of rotors in the future. I stripped, sanded, and painted the front rim with some quality satin black wheel paint and it looks awesome. I used a large plastic tub that fit the wheel and wet sanded the entire thing by hand. Sandblasting would have been considerably easier but my blast cabinet is not large enough. Sanding all of the backside and the nooks took forever. Next time I would pay to have it blasted at a shop. It came out looking awesome though and I can’t wait to see the now completed front end reassembled on the bike. 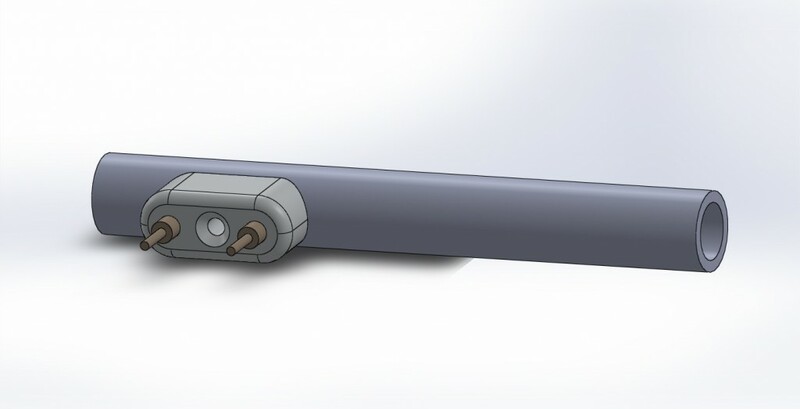 You have to use your imagination a little bit for the above image, but this is the 3d model of the handle bar switches I will use on the bike in place of the stock ones. I will have the CNC machine bang out two of these. They can each house 2 switches or buttons. I ordered the right size cutter some time ago to make these and plan to get them machined in the coming week. The wires will run through the handlebars and it will be a nice clean installation. You can see the battery and solenoid fitment in the belly box. Sadly it warped a bit when I welded it up. I did not take my time and regret it. I’ve hammered it back a bit and used the press to get it to fit comfortably in place. You can not tell on the bike but seeing it from the top like this it is apparent that it is a bit skewed. I will make a bolt in hold down strap for the battery and this bit of custom fabrication will be 100% done. I will need to address the wiring as well in the reassembly stage which I am fast approaching. That’s all for now, more soon as I want to get this project finished and out the door ASAP. Greetings, here some pics of my project. Nice project. Looks like you are moving along nicely on it! Thanks for the battery box schematic. Not that it would be too bad to figure out, but every time savings bit helps a ton. Great site. My CX is a daily driver, too… so I gotta ride, wrench, repeat! I can’t imagine working on a bike that was my daily rider. I’m impressed that you are so disciplined. I hope to finish up my cafe racer this winter. I’ve been playing with multiple handle bar options after deciding I didn’t like the clubman ones I bought originally and it is holding me up. Thanks for visiting my site! Hey Zac are you still building this thing or is it done? Awesome documentation of the build, love the look. I’m still working on the bike. Finding time to finish it has been hard with all that I have going on these days. I need write up a few posts to get my blog up to date. 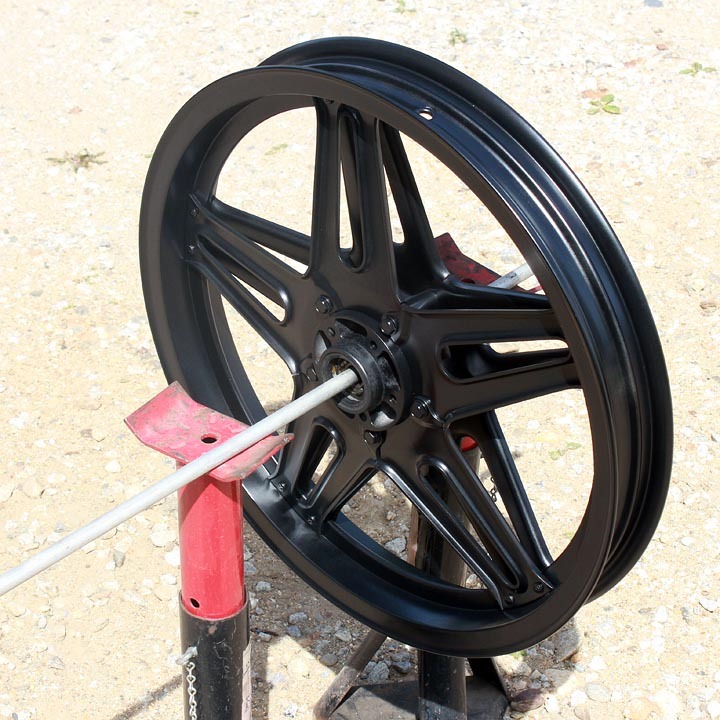 The wheel paint won’t chip when you put the wheel back on? If you are careful and use a bit of rubber hose split down the middle when prying the tire over the rim you will not chip it at all. They sell some hard polypropelyn rim protectors for this purpose but I’ve always just used a length of hose/tubing cut the long way to protect the rim. Building my CX at the moment, love the battery box. going to be making something close my self..
One question. How does this attach to the bottom of the bike? I see two “eyelets” that are on the front end of the box. is this all that is securing the battery box in place? It attaches on both the front and rear, I’ll try to get some pics and put them up. It attaches where the original exhaust “bolted” in under there on the bike. I folded up some tabs and welded them on. It sorta slides into a slot with a longer bolt on one side. Hope that helps. If I remember I’ll take a few pics and put them into the post for you soon. how much do you charge to drill rotors??? sweet bike by the way. David, I’m sorry but I don’t do that sort of work for people. Too much liability and the like. Thanks for visiting and glad you like my bike. I’m working on finishing it up this spring. Hope she’s on the road this season. Loving the bike man!! I got some questions about the battery youre using; how many volts/amps are you getting out of it and what is are the approximate dimentions of it?? I’ll try to remember to check this for you tomorrow. 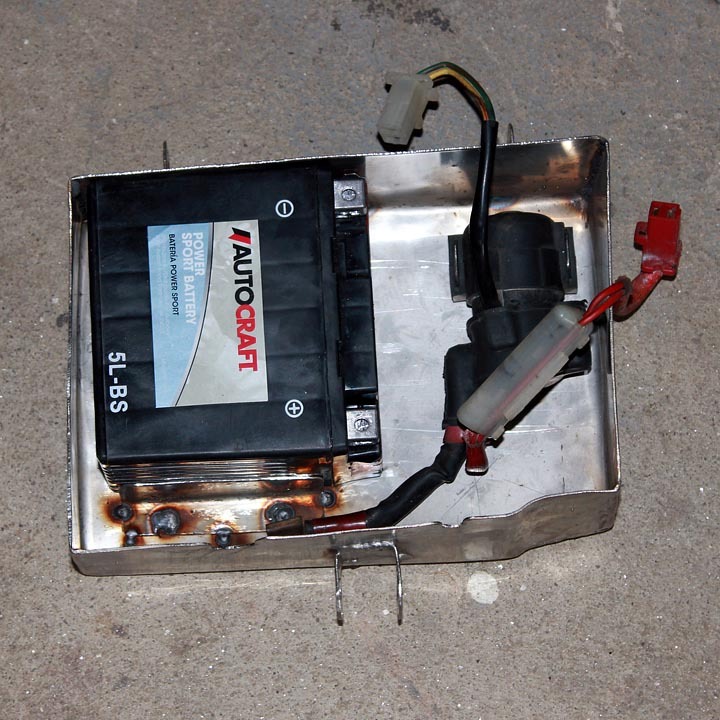 It’s a pretty small battery close to the smallest one I could find, an AGM so it can be sideways. I figure I don’t need a big battery for the bike. It will have all LED lights and just needed enough oomph to turn it over. Which it does just fine. I’ve rewired the entire bike and stripped all the factory wiring. It was a mess and the connectors all badly corroded. I’ve been bad about updating my blog and progress on the bike. I’ll try to find some time to share some more of my progress. Curious about your handle bar switches, is it just the switch housing or the whole pipe. AND a better question… did you make a few extra 🙂 ? Im interested… My switches are stainless and 12mm… but if these are done, id buy new switches to fit… let me know.. I really like the bike! It looks really good! It’s my own design. You can take the drawing from the post or I can make sell you one if you are not in too much of a hurry for it. I’m way overloaded with work right now so it may be a couple weeks. How much would it be for the bracket? I have it listed on my parts for sale page. 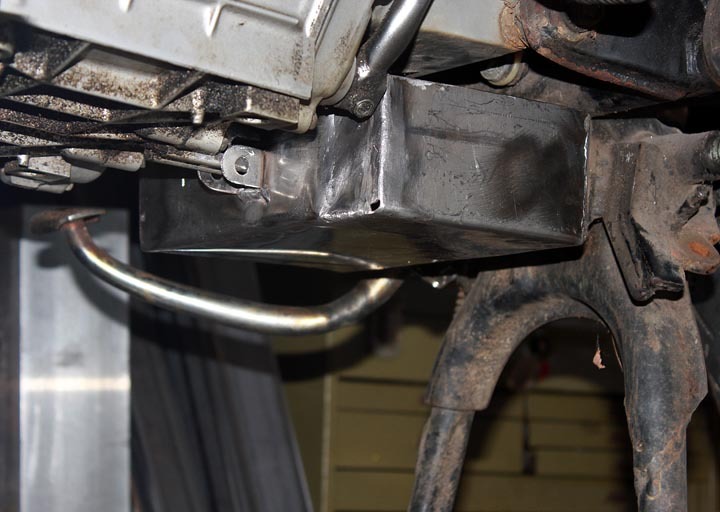 The price for the headlight mount bracket is $40, plus international shipping. It’s a 5L-BS by Autocraft. It’s much smaller, in size and ratings. I’m going all LED on the lighting, and I’ve rewired the entire bike removing anything unnecessary. It starts the bike fine, which is the only time you need the larger current rating IMO. It tucks up nicely under the bike. I need to find time to share more posts on my CX500 build. Really impressed with your handy work and knowledge. Your battery box schematic helps immensely! And your custom exhaust…I wish I had your skills! Well done! During your rebuild, what are you exactly eliminating? Aside from the air box. And perhaps a chopped rear end. There’s so much electrical parts/stuff that I need to relocate, but not exactly sure where I’ll conceal it. I’ve pretty much pulled everything I didn’t need. All the lights wiring that was oem (running smaller guage multi wire cable to LEDs). If it wasn’t part of the stock ignition and charging circuit it went. I have a new wiring diagram showing what I kept somewhere. I’ll see if I can find it and post it up for you. I’m really busy working and haven’t had a lot of time to post, but I have media for a few posts on rebuilding the carbs, 3D printed custom fenders, and a slew of other things for the bike. Just need to find time to write and share em. I tucked most of the ignition bits up under the seat. There’s a space perfect for them in between the upper frame tubing. I’ll try to take some pics and share them for ya in a new fast and dirty update post. Water wont do any harm for the selenoid? I don’t think so. My bike seems ok but it never sees rain. 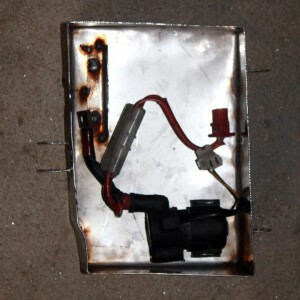 There are drain holes in the battery box if water does get in there. I think the solenoid is designed to be wet and work. Hi Zac, great blog and photos! I would like to drill my cx500 rotor and I like your hole pattern. Would you post the rotor drill dot pattern you used to mark your drill spots? Hi Mike, I will look and see if I have something, I think I did the math on a piece of paper and used the angles on the rotary table when I drilled it rather than a CAD template.